Today we meet the students and other adults at the Beijing departure gate. Fran and I look forward to seeing everyone again and preparing for the big NCISC/BYSCC event. It was a good flight and we actually arrived a little early to the Beijing airport. I don’t believe anyone got much sleep, but that is something we can look forward to this evening. Upon our arrival and clearing customs, we were greeted at the gate by three BAST student interpreters. The bus driver got us to the hotel where we checked in and were able to get settled for the evening. Looking forward to the Embassy visit on Friday. Today we travelled to the US Embassy…such a treat! We were greeted by Dr. Nancy Sung and she introduced us to three of her co-workers. After taking us on a tour of the facility, Dr.Sung met with the group in one of the conference rooms and talked about her work as well as the work of her division. Prior to leaving the Embassy, we visited the area where workers could purchase grocery and other items. I bought a sweatshirt with an official Embassy seal on it. I collect sweatshirts and was thrilled to add this to my collection. What a great visit! 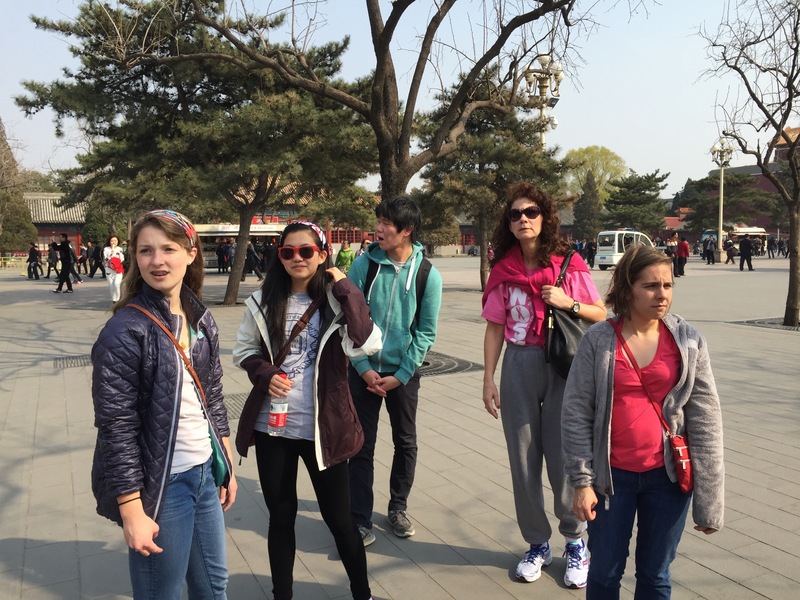 This afternoon we’re off to the Forbidden City before the competition begins tomorrow. Today students set up their projects/research inside the school in preparation for the BYSCC event. Students defend their research today. This takes place in closed session with the judges. The adults visit Peking University which is a partner this year with BAST. The award ceremony is later today. Three of the four students were recognized this evening. Two of the four students received second place and two received money for their innovative science work. I’m sure the fourth student will be recognized tomorrow. Non-chinese students have not been eligible to receive money in recognition of their science research until this year. Wow, what a great evening. Today was the closing ceremony and final awards were presented. Our fourth student received a first place award. Also, Fran was recognized for his dedication to science education and merit in the field during the award ceremony. Wow, what a great day! Today was dedicated to the Great Wall and shopping. The temperature/weather has been exceptionally good (except for smog) throughout the visit and perfect for outdoor activities. Good closing to the week! Today we departed for the United States. Our trip from the hotel to the airport was eventful trying to get through traffic. It was also a time to say goodbye to most of the staff who worked with our delegation during the visit. Goodbyes are never easy, but the student interpreters had to get back to their studies just as we had to get back to school and work. Once our flight arrived back in Detroit, Russ found a restaurant and the delegation members had a late lunch and celebrated birthdays for two of the delegation members. Russ, thanks for doing that. In closing, this was a great group of students and adults who represented the SMT/BWF well during the trip. Thanks to the generosity of Sam, Lisa, and John Burris, students were able to compete with peers from other countries in a unique innovative science experience, and the adults were able to engage with leaders from other delegations and hopefully pick up ideas to they can take back to further science education in their field or workplace. Thanks for the opportunity!